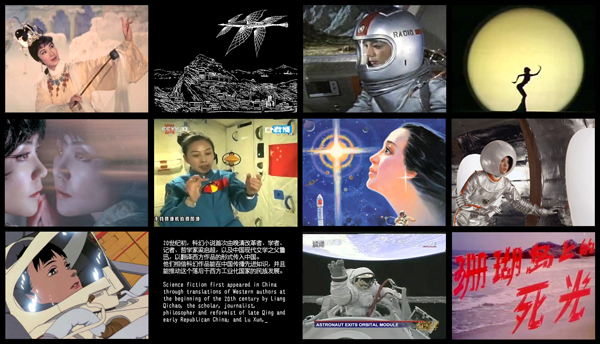 This work focuses on the concept of “future” in Chinese modernity, and particular, how it is manifested in the unlikely relationship between sci-fi and 20th century Cantonese opera. The former has been at the core of Chinese modern reformation, the latter is viewed more as a potent modern national identifier, than as a continuous art form, surviving from pre-modern times unaltered. The structure featured as part of the Shanghai Biennale could represent the deck of a space ship in a fictional Chinese sci-fi movie from the 1960s or 1970s. Although China’s radical approach to both tradition and to redesigning the future was different from communist countries elsewhere during this time, Wong nonetheless incorporates elements from an icon of 20th century Soviet cinema. Specifically, the artist references Tarkovsky’s Solaris (1972), its oceanic landscape and infinite horizon of islets. The individualist melancholy and alienation of the film are contrasted with a history shaped by the scale and scope of the Cultural Revolution.